Deb's Cup of Tea: Almost Done. The stack is not very big this year. I've gone for smaller parcels easier to ship. I have 3 small items to get and have 2 to finish and I'm done. I used to try to be done by Thanksgiving, back when Carole was small, because I felt the running around of the holiday season was frantic enough without trying to find that one perfect gift for someone. But, with Carole long gone and it just being me, I can wander the malls and shopping centers looking for something so long as I get it out of my house by the 20th. A box heads to Carole and David today and I'll be shipping the rest next week, although there is one gift that won't be ready until after the 18th. I put the wreath on the door yesterday but I'm on the fence about setting up the tree. It's such a labor, to drag the bin upstairs, assemble the tree, disassemble the tree, drag the stuff back downstairs. So, I just don't know. I was telling Pam that perhaps I should look into a small, table-top tree. It would be easier to store and easier to set up. But, I have years and years of ornaments and I do like putting them on the tree. Decisions. Decisions. 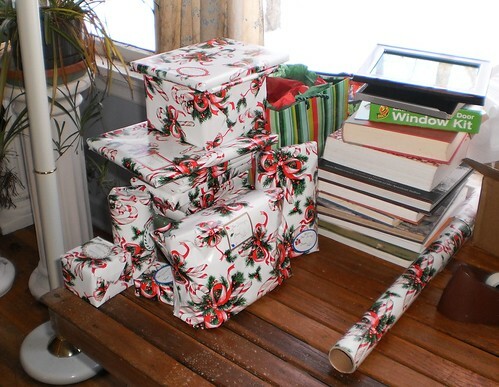 At least I don't have to decide what wrapping paper to use. I have a lot left of the candy cane so that's what they are getting.